C. I.B. ATILLIO DI ASSONANZA BIS !!!! ASSONANZA - res BIS BREEDING GROUP!! GREAT DAY for ASSONANZA team!! ASSONANZA – res BIS BREEDING GROUP!! BUCCO DI ASSONANZA BOB, BIG!! C.I.B. BUCCO DI ASSONANZA – open cl. (3/3) Exc. 1, CAC, CACIB, CAC CMKU, BOB, BIG!!! VERONIKA STEMMER with ARIS DI ASSONANZA - JUNIORHANDLING II – 3rd place!! BUCCO DI ASSONANZA BOB, res BIG!! C.I.B. 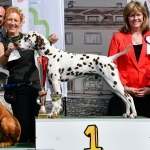 BUCCO DI ASSONANZA - champ cl (2/2), Exc 1, CAC, CACIB, BOB, res BIG!! Assonanza - 3BIS BREEDING GROUP !! Brixi with Beetowen res. BIS couple!! C.I.B. Brixi Di Assonanza and C.I.B. Beetowen Di Assonanza – res. BIS couple!! Assonanza – 3BIS BREEDING GROUP ! !